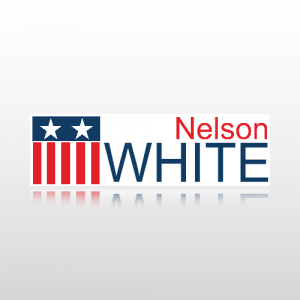 Nelson White Bumper sticker, white background with flag. Select a size and Material to get going. For any assistance contact us at 1-800-257-6091 or use our live help service. This decal is printed on our standard calendared vinyl. This durable vinyl will hold up for several years indoors or out. You will be given an option to upgrade to premium “cast” vinyl upon checkout. This is recommended if you need your decals to hold up outdoors for 5+ years. For added fade resistance, scratch resistance & even longer life, add our premium “cast” laminate.